Star Wars is once again taking over the galaxy with the seventh film in the saga, The Force Awakens, continuing the adventures of Luke, Leia, Han and their compatriots, along with new heroes and foes alike. While the Star Wars films are generally considered to be in the genre of science fiction, and indeed, are usually rated PG, or after Return of the Jedi, PG-13, for “Sci-Fi Action Violence”, there are a great many horror elements to be found in all the films, from terrifying creatures and evil, demonic-like villains to severed limbs and smoldering, burnt bodies. The very nature of the title, Star WARS, denotes that mayhem and carnage will ensue, and often in grisly fashion. So, while some refer to the Star Wars Universe as strictly science fiction, and others prefer to call it a “space opera or fantasy”, here at the Gore 4, we’d like to take a look at each of the theatrical films and delve into their horror aspects. Rather then start at the beginning of the storyline with a young Anakin Skywalker, it makes more sense to begin our descent into the “dark side” with the first film to hit theater screens back in 1977, the original Star Wars. When the original Star Wars exploded onto screens in 1977, it was unlike anything that anyone had seen before, from its fantastical creatures to the incredible space battles. And right from the start, we were introduced to perhaps the screen’s greatest villain of all time, the black-helmeted and cloaked, mechanically-enhanced Darth Vader. More evil and more deadly than any number of horror characters that would follow, Vader from the outset is seen snapping necks and choking to death anyone not performing up to par. It’s this imposing figure’s storyline that forms the crux of the saga’s six films (and beyond), and as we will ultimately discover, there are a long list of bodies left in his wake. As the droids C-3PO and R2-D2 reach the desert planet of Tatooine, we are introduced to a number of scary, dangerous creatures, and see the first signs that the world of Star Wars, despite appealing to kids, wasn’t going to hold back when it came to violence and gore. The first deadly beings we see are the Sandpeople, clad in layers of clothing from head to toe (who knows what terrifying visages lie beneath their bespectacled masks), who proceed to attack Luke, and cut off C-3PO’s arm (only the first of many times we’ll see the golden droid in more than one piece). This attack only hints at the violence to come, first in the form of slaughtered Jawas at the hands of the Stormtroopers, to the horrifyingly burnt, smoldering, skeletal remains of Luke’s dear Aunt Beru and Uncle Owen. While this devastation is occurring on Tatooine, Princess Leia is being tortured on the Death Star by a scary-looking mind probe loaded with implements that make a trip to the dentist look like day at the spa. Speaking of the Death Star, has there ever been a more destructive device?, one whose powerful forces we are witness to as it obliterates the peaceful planet of Alderaan in one single shot. Back on Tatooine, at the colorful, to say the least, cantina, located within the notorious Mos Eisley spaceport, when a drunken smuggler by the name of Ponda Baba decides to pick a fight with innocent Luke, we see how lethal a lightsaber can be when Ob-Wan Kenobi wields it to slice off this particularly wretched scum and villainy’s arm. The lopping off of an arm or hand would become a recurring, and important, occurrence throughout the Star Wars’ films. Later, future Rebel hero, but for now, space pirate, Han Solo employs a blaster to dispatch fellow bounty hunter, Greedo (better to shoot first, ask questions later, or not, depending upon which film version you see). For the rest of the movie, most of the violence on screen occurs in the form of space battles. But after the explosive destruction of the Death Star, and a triumphant rebel celebration, things are about to get dark…. Though the rebels won the Death Star battle, the war against the Empire rages on, beginning on the inhospitably cold, icy planet of Hoth. Here, Luke is attacked by a furry, white, bear-like animal called a wampa, which proceeds to kill Luke’s ride, the kangarooish, horned tauntaun, while saving Luke to munch on later. At the wampa’s cave, we see him gnawing on the tauntaun’s remains, dangling connective tissue and all, until Luke manages to break free and escape, but not before shearing off the beast’s arm. Later, when Han finds a frigid Luke in the wintry landscape, when his tauntaun succumbs to the sub-zero temperatures, he uses Luke’s lightsaber to slice it open, and we observe the delightful view of its warm, pungent intestines spilling out onto the snow. Indeed, we wouldn’t see so much blood and viscera and limbs splayed out over a white, snowy terrain until John Carpenter’s masterpiece, The Thing, two years later. Once off the blizzardly world of Hoth, our heroes continue to face threats from strange, deadly creatures. Han, Leia, Chewy and Threepio, upon seeking refuge from TIE fighters within the cave of an asteroid, face off against space parasites known as mynocks. 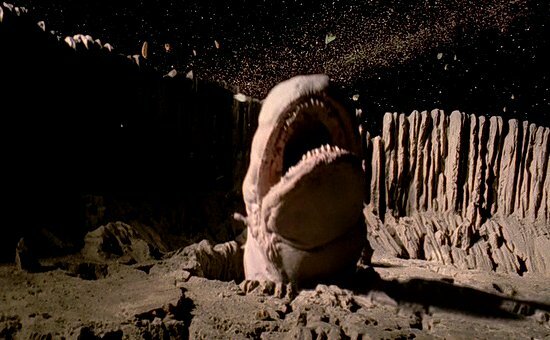 To escape this menace, they take off in the Millenium Falcon only to discover that this ‘cave’ is actually a ginormous space slug which narrowly misses making a meal out of the Falcon. Concurrently, Luke and R2D2 encounter their own perils on the planet of Dagobah, a lush, swampy world full of various beasties, one who swallows R2 before deciding he’s not the tastiest of morsels. Luke, upon training with Jedi master, Yoda, encounters an image of Vader and proceeds to decapitate him with his lightsaber. The actual Vader, meanwhile, persists in crushing the windpipes of anyone failing him in his quest to thwart the rebels. When our rebels eventually encounter Vader on the cloud planet of Bespin, the results aren’t pleasant. Han is tortured and ultimately frozen in carbonite, Threepio ends up in pieces (another recurring event), and Luke, upon facing his adversary face to mask, and learning some startling news, has his right hand sliced off by Vader after a lengthy lightsaber battle. The only positive is that assumedly the heat from the lightsaber automatically cauterizes the wound in the process. So, let’s see – dismemberment, decapitation, evisceration, suffocation and torture – is this a galactic adventure or an Eli Roth film? He’s more machine now than man, twisted and evil. After the harrowing events of Empire, things aren’t looking very bright for our rebel heroes as the next film in the saga begins. Here, everyone is brought together at Jabba’s palace, home to the disgusting, slobbering, giant slug kingpin. In the backrooms, we’re privy to droids being tortured, while Jabba is shown snacking on live frogs. 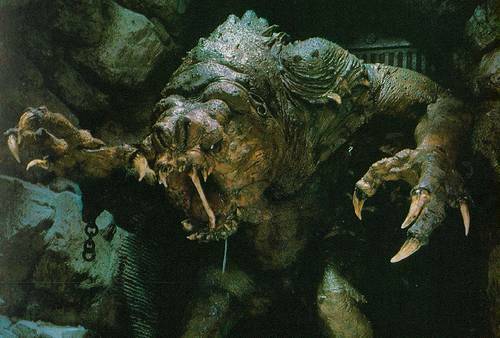 We’re also introduced to two of the most horrific creatures in the entire Star Wars universe. The Rancor is a monster kept in Jabba’s palace to entertain its denizens by dropping victims into its pit and watching it devour them whole. Once Luke is able to defeat this megabeast, he and Han, now unfrozen from his carbonitic chamber, are sentenced to perhaps the most excruciatingly gruesome deaths imaginable. At the pit of Carkoon, they are told they will experience “a new definition of pain and suffering, as you are slowly digested over a thousand years,” by the dreaded Sarlacc. As we only see its toothy mouth and tentacles, one can only conjure up what monstrosity lies beneath the desert sands. While one would surely die from any number of maladies before ever reaching a thousand years, it still seems a much more ghastly death than one would experience in any horror film, where the end often comes swiftly. While some of Jabba’s guards are indeed swallowed up, including notorious bounty hunter Boba Fett, our heroes manage to escape this horrifying fate. And though Luke has shown that he too possesses the ability to choke others by using the force, like his father before him, a scantily-clad Princess Leia must do it the old fashioned way, as she enacts vengeance on her captor, Jabba, by strangling him with the very chains he used to shackle her with. After the events on Tatooine, Luke returns to Dagobah to complete his Jedi training from a dying Yoda, who tells him, “anger, fear, aggression, the dark side are they. Once you start down the dark path, forever will it dominate your destiny.” Perhaps it might be better to save the politics for later, and explore the relation to our current state of affairs another time, but it’s hard not to note the character (or lack of) traits Yoda describes and see the striking similarities in certain bombastic, fear and hate mongering individuals today who have the audacity to think they are worthy of higher office. George Lucas may have created a world long ago in a galaxy far away, but its principles very much apply to our world today. So, while Han, Leia and company fight alongside the cute and cuddly Ewoks, wielding their primitive weapons of rocks and spears, on the forest moon of Endor against Galactic forces, Luke attempts to settle some family differences on the newly constructed Death Star. Despite the urgings of an overly-confident Emperor Palpatine, as evil and monstrous a villain as in any horror film, Luke refuses to succumb to the dark side. 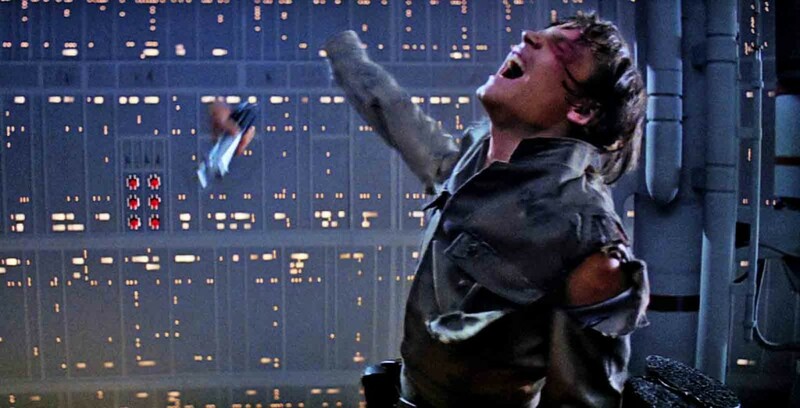 While fighting Darth Vader, he continues the tradition of dismemberment, by cutting off his father’s hand. And Vader’s soul is ultimately spared when he sacrifices his own life to save his son by tossing the wretched, scarred Emperor to his much-deserved death. 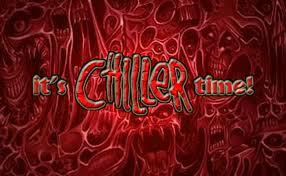 Good has finally won out over evil, an outcome similar to that in many horror films. As the ultimate celebration in the Star Wars universe commences, fans will have to wait almost a decade and a half to discover what led up to all the horrific events of the original trilogy. The first film in the Star Wars timeline (though fourth to be released) remains the most divisive among fans. While newer fans to the franchise embraced the film, many older fans who grew up on the original trilogy were left underwhelmed and disappointed. Whether it was the overreliance on CGI, a storyline too mired in Senate proceedings and trade agreements, an unproven young actor as the child-to-be-Vader or the bumbling Jar Jar Binks, The Phantom Menace nonetheless was a huge success at the box office and reestablished Star Wars as a force to be reckoned with. And while death, destruction and danger were certainly prevalent in this first of the prequels, it remains the least dark of all the films, as much of the action centers around a young child with a storied future ahead of him. Yet there are a couple of horror elements worth mentioning. When Jedi Master Qui-Gon Jinn and his apprentice, Obi-Wan Kenobi, arrive on the planet of Naboo, they encounter a number of dangers from a variety of creatures. After surviving a stampede from an array of animals, they take an underwater journey (a Star Wars first) where they repeatedly manage to escape from a number of denizens of the deep, each one being preyed upon by another larger and more ferocious creature. It’s a clever sequence showcasing nature’s food chain. 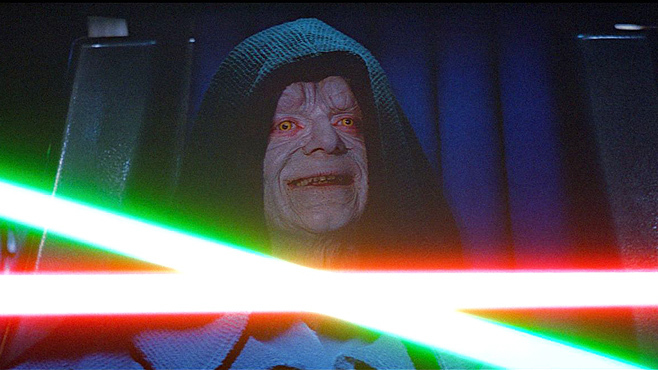 Star Wars wouldn’t be Star Wars without a villain representing the dark side of the force. Whereas the evil Darth Sidious orchestrates his maneuvers under a veil of secrecy, he sends his apprentice, the Sith Lord, Darth Maul, to do his bidding. 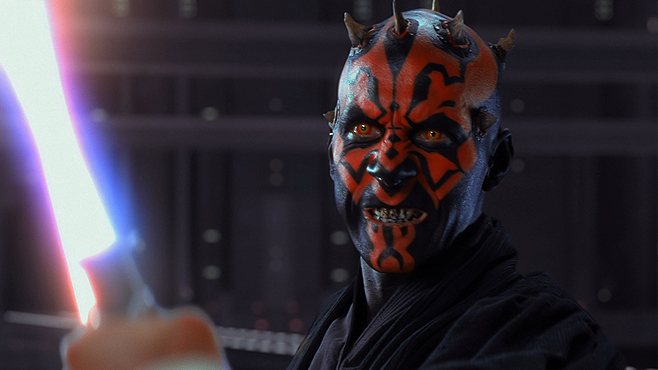 Of all the Star Wars villains, Darth Maul may be the most visually vile looking of them all with his red and black, multi-horned, demonic looking visage. He comes about as close as possible to the standard depiction of the devil himself and could rightfully step into any horror film and compete with the likes of Freddy, Jason or Pinhead. And though The Phantom Menace is the only one of the six films not to feature a hand or forearm cut off via lightsaber, it does give us the immense satisfaction of watching Obi-Wan bisect Maul just below the waist as he separates with each part falling down an endless shaft. But a new, future Sith Lord is waiting in the wings. Now that Anakin Skywalker is older, and serving as apprentice to Jedi Master Obi-Wan Kenobi, this is the film which sets the stage for Anakin’s descent into evil. 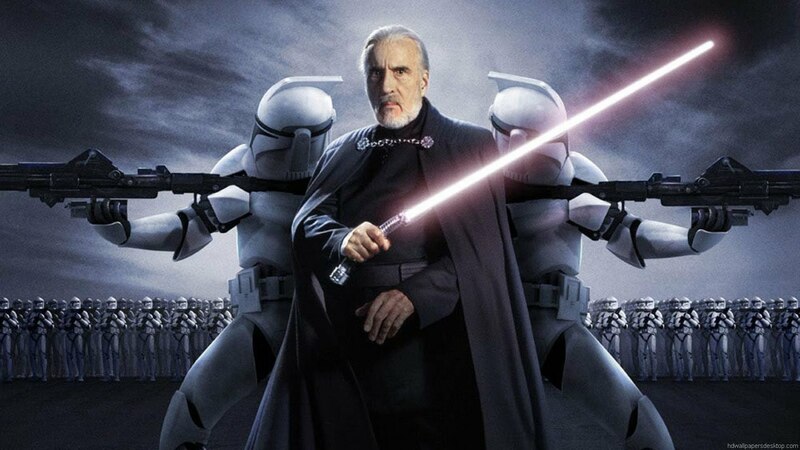 We are introduced to another Sith Lord, Darth Tyranus, aka, Count Dooku, a former Jedi Master who was lured to the dark side. Our heroes’ first perilous encounter comes when Senator Padme Amidala is almost killed by a couple of deadly worms, dispatched by a shape-shifting assassin, who in turn is killed by the bounty hunter who hired her, but not before Obi-Wan resumes the pattern of limb removal by slicing off her arm. 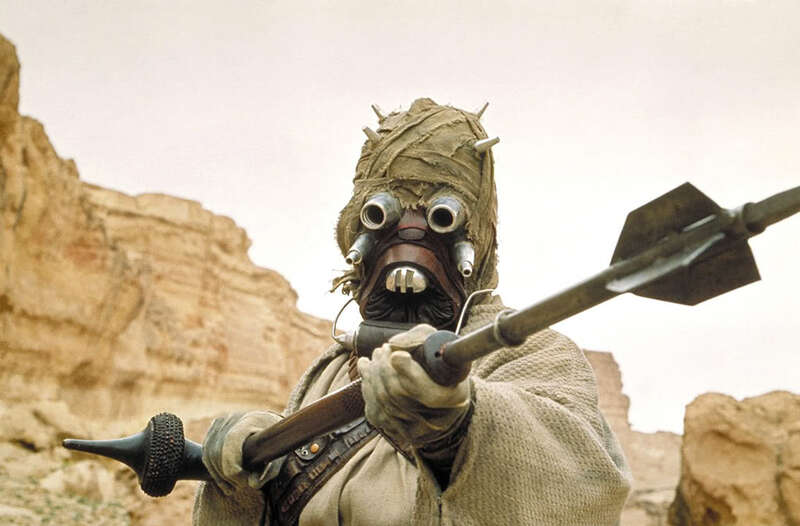 Later, when Anakin returns to his home planet of Tatooine to find his mother taken captive by the scavenging Tusken Raiders, her death in his arms sends him into a murderous rage where he kills everyone at the Raiders’ camp, including children. 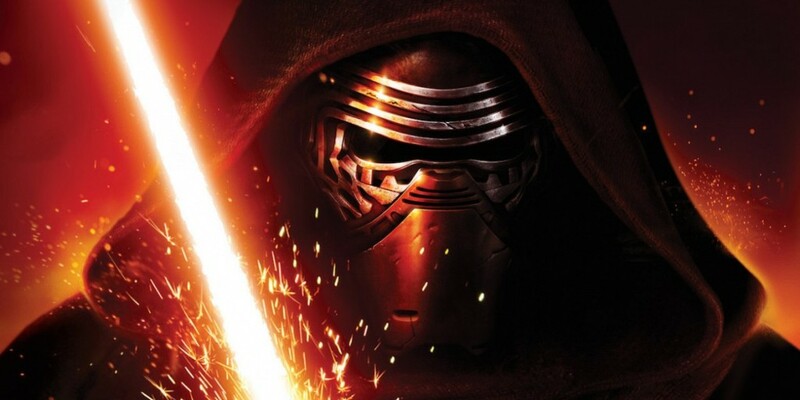 This is the event which ultimately catapults him towards the dark side. 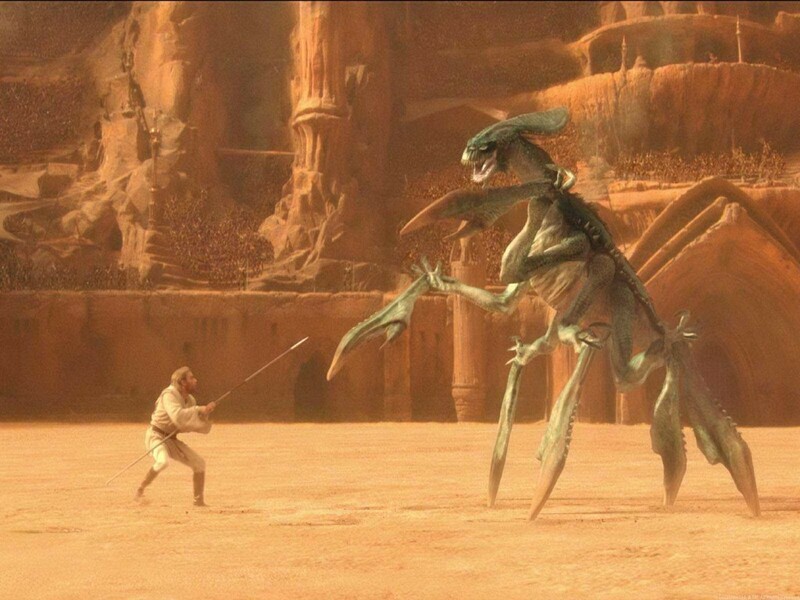 In one of the saga’s most exciting setpieces, a captured Obi-Wan, Anakin and Padme are chained to posts in an arena full of spectators on the planet Geonosis, where they are to become fodder for a trio of gigantic, fantastical beasts-a crab-like crustacean sporting lethal claws, a furry, multi-eyed feline with sharp talons and razor-like teeth, and a lumbering, horned herbivore. However, these massive monsters are no match for the wits and skills of the heroes, who dismember, strangle and spear their way out of certain death. What ensues next is one of the most visually striking scenes in the saga as the greatest assemblage of lightsaber-wielding Jedis, alongside a battalion of clone troopers, battle an army of droids. It is during this sequence that Jango Fett, father to future bounty hunter, Boba Fett, and the genetic mold for the army of clone troopers, is decapitated by Jedi Master, Mace Windu, right in front of his son. We now know where the kid got that chip on his armor-clad shoulder. C-3PO, meanwhile, is once again in more than one piece, having been decapitated himself during a harrowing incident at the droid manufacturing plant. Anakin and Obi-Wan find themselves in a lightsaber duel with Dooku, who severs Anakin’s arm before fleeing after another duel with Yoda. The infamous Clone Wars are about to begin, which leads us to the darkest chapter in the space saga. The dark side of the force is a pathway to many abilities some would consider to be …. unnatural. At the beginning of chapter number three, we are introduced to another of the Star Wars universe’s original and colorful characters, the quadruple-armed cyborg, General Grievous. More mechanical than even Darth Vader would become, the wheezing, coughing Grievous has very little organic matter left in him, and the fact that he can brandish four lightsabers, gathered from his Jedi victims, makes him even more formidable. Alas, Obi-Wan manages to cut off some of these arms and ultimately kill him. Meanwhile, Anakin, urged by the Emperor, is beginning his plunge towards the dark side, first by slicing off Count Dooku’s hands before decapitating him, then by cutting off Mace Windu’s hand, enabling the now fully revealed and hideous, Darth Sidious, to kill the Jedi Master. Twisted by the dark side, Anakin proceeds to eradicate the few remaining Jedis left. In what completely cements his descent into the dark side, he mass murders the young Jedi children in training with Master Yoda. Besides Obi-Wan, Yoda is the last surviving Jedi, and so must make his escape, after removing a few of the now Empire-controlled clone troopers’ heads from their bodies. We are now in full-on horror mode as Anakin, now Darth Vader, faces off against his master, Obi-Wan, on the volcanic planet of Mustafar. Amidst a backdrop of spewing lava, we bear witness to a literal hell of a world as these former friends have now become foes, as Anakin/Vader proclaims, “If you’re not with me, you’re my enemy.” However, a wise Obi-Wan fires back, “Only a Sith deals in absolutes.” (Once again, the world of Star Wars reminds us of real world events, as a recent, former U.S. president declared the exact same thing as Vader.) After a lengthy duel, Anakin’s rage renders him vulnerable, and a pleading Obi-Wan has no other choice but to attack him, cutting off an arm and both his legs in one fell swoop, and leaving him behind, crawling amidst the lava, all but immolating him in the process. Rescued by Sidious, the burnt, barely alive remnants of Anakin are repaired and equipped with the devices that will allow him to survive. When he emerges as the black-clad Darth Vader we are accustomed to, he is a virtual Frankenstein’s monster come to life. Oh, and Padme, who was aghast at the monster her love had become, dies in childbirth after gifting life to twins, Luke and Leia. Folks, this is as bleak and twisted as they come, and up there with the nastiest horror films you can think of. Now, as 2015 draws to a close, Star Wars fans have received the ultimate holiday gift, the first new live-action film in a decade. While the dark side once again rears its ugly, masked head, and innocents are killed and lightsabers slice and dice their way through victims, the film is noticeably absent of the carnage and gore the other films all possessed. Apparently, though director J.J. Abrams has a penchant for blowing up entire planets, he doesn’t have the same fondness for bloodletting and butchery that George Lucas, and his contemporary, Steven Spielberg, have repeatedly shown. 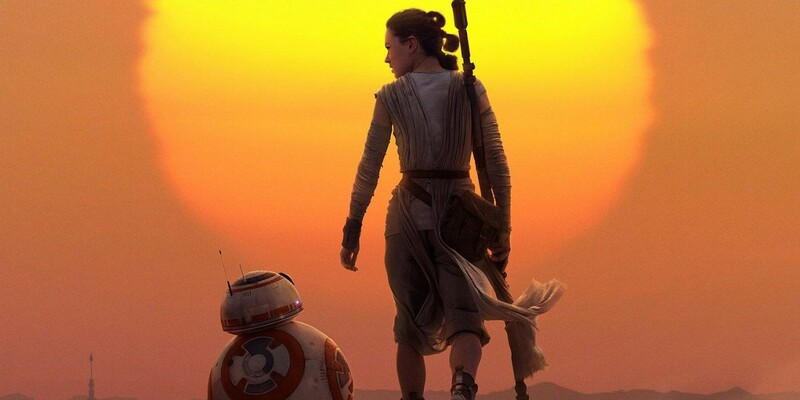 No matter, A Force Awakens is an absolute thrilling return to the Star Wars universe, featuring beloved characters from the past, and exciting new characters for the future. While this incredible galaxy so far away continues to be a dangerous and violent one, with peril and risk of death at every corner, as the saga continues, with stand alone films in between, featuring new and different writers and directors, we’ll see how wicked and grim succeeding films will become as they explore the never-ending battle between good and evil, between the dark and the light, and between hope and despair. 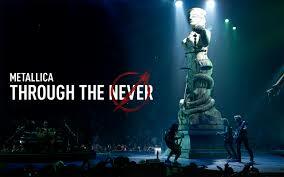 Until then, we’ll leave you on a positive note with this absolutely wonderful and masterfully created musical treat, courtesy of The Tonight Show starring Jimmy Fallon, featuring Jimmy, The Roots and some familiar faces. What the Gore 4 so aptly points out in “The Horror of Star Wars” is that despite its cosmic trappings, the series contains dramatic elements that are depicted in frequently gruesome and horrific fashion. It’s easy to lose sight of such depictions given the context of the films — but perhaps if John Williams’ lush, romantic scores were replaced by post-modern, atonal dirges, and the screenplays didn’t operate so prominently in the realm of grand, poetic myth, then the Gore 4’s citations might be remembered more prominently. However, the Gore 4’s observations make it clear that the Star Wars cycle of films are firmly mature entertainment; their elaborate trappings may make audiences forget that, but the aforementioned examples offer undeniable proof. I agree that music plays a big part in the Star Wars’ films, and perhaps plays a factor in the prequels’ less favored reception. The original trilogy featured themes for all the major characters, and were so memorable, when they were repeated during the end credits, you wanted to stay though to the end just to hear such an amazing score. But then, maybe the music for the prequels was less compelling because the characters themselves weren’t quite so engaging as Luke, Leia, Han and Vader (though, I did think the Anakin/Padme theme had a strong emotional feel to it.) And yes, if the films had been scored more menacingly overall, and less triumphantly, we might have a slightly different perception of them.